Continuing with our study and practice of lectio, we might find the following article helpful. Before we look at this, however, I'd like to plug in one extra step that I've found helpful over the years (it's one I was taught to use when praying with scripture in the Ignatian spiritual exercises). This is: after the time of reading and prayer, I make a note of what has happened - even if that appeared at the time to be "nothing." This doesn't have to be long or wordy; it's simply a way to keep track of what verse might have struck me, or how I may have felt drawn to pray, or what things came up between Our Lord and me during this time. I keep a special prayer journal for such notations, and find that it helps me see patterns as days and months go along. And now... something I found on "Zenit:"
The cardinal went on to offer the faithful four easy steps for lectio divina. First, one reads the passage. 'In this first instance, one attempts to understand the text exactly as it appears, without pretending to extract from it immediately messages and conclusions,' he said. With these four steps, Cardinal Scherer said experience teaches that it is not difficult to practice lectio divina. 'It's enough to start; it is learned by being practiced,' he said. 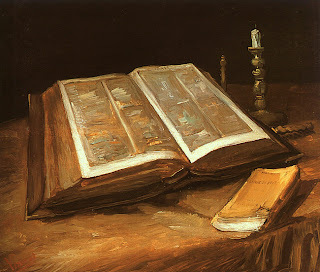 'The preciousness of the Word of God and its importance for Christian life, moreover, well merits an effort on our part.'" (article from Zenit, September 15, 2009).